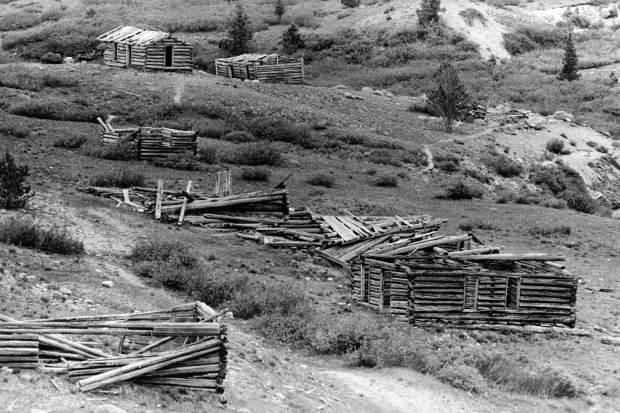 One b/w photograph of several old cabins at the ghost town of Independence, 1950-. 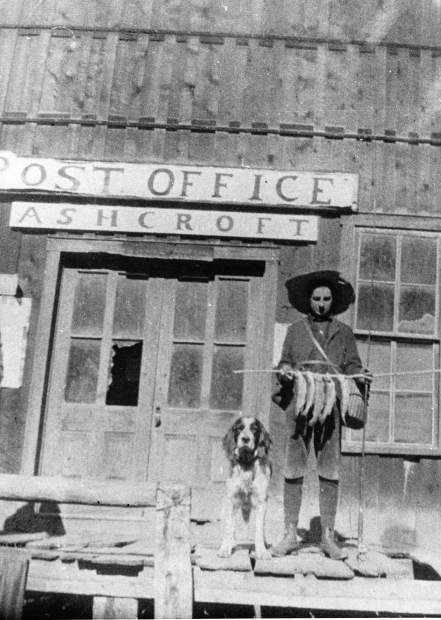 One b/w photograph showing the town of Ashcroft in 1920. Several buildings are visible, and the one with white paint is the Blue Mirror Saloon and the one across from it with a facade is the old Post Office. One b/w photograph of several men in a World War One army truck with solid rubber tires, 1920-. The photo was taken along Independence Pass, near the ghost town. The mill can be seen in the background. 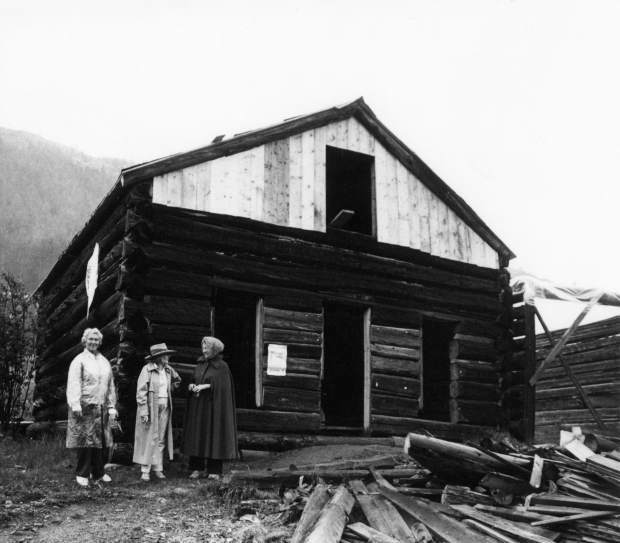 One b/w photograph of three unidentified women standing in front a building at the ghost town of Independence. 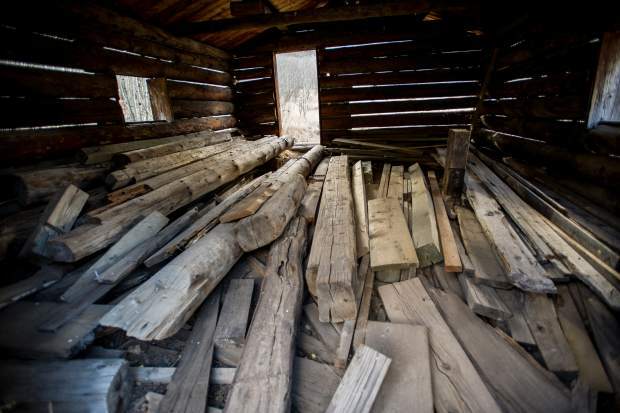 The building is being restored, and the upper section of the building is constructed of new, lighter wood, and there are several pieces of dark wood lying in front of the building. 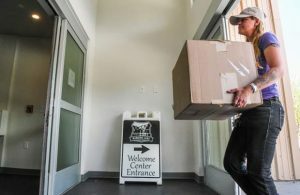 The women were at Independence to celebrate the "High Rockies Shindig," which was attended by 100 people. 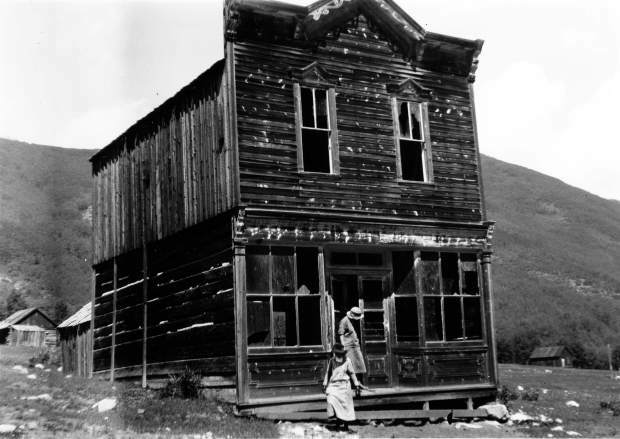 One b/w photograph of two women outside the Hotel View at Ashcroft, 1926. One b/w photograph looking down Aspen Avenue (Main street) of the Ghost Town of Independence. 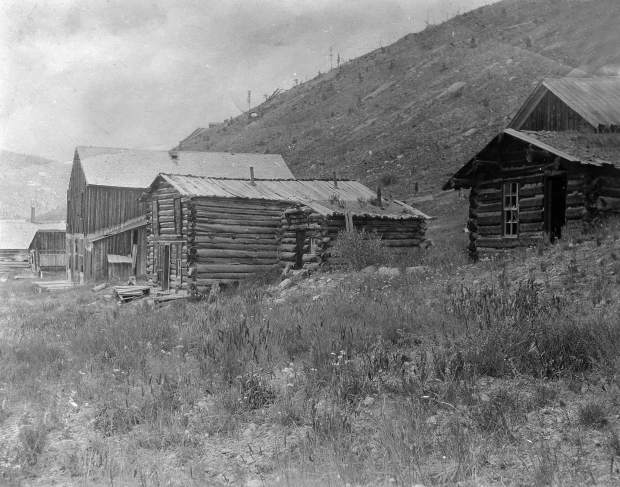 In the foreground of the photograph on the right side of the street is a cabin with walls still standing which can be seen from the side. Along the same side is a row of collapsed structures. On the left side of the road is a single structure which has at least three walls still standing but no roof. 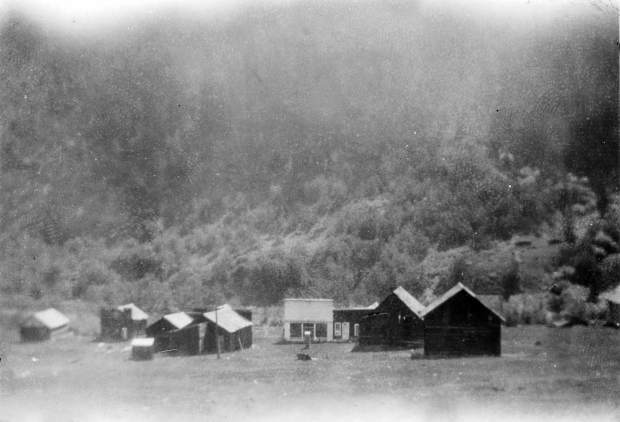 In the background of the photograph there are two standing cabins standing parallel to each other. The cabin on the left has a partial roof still intact while the right cabin appears to have wood still attached to the roof. Published in the Aspen Times July 3, 1980 on page 1-b. 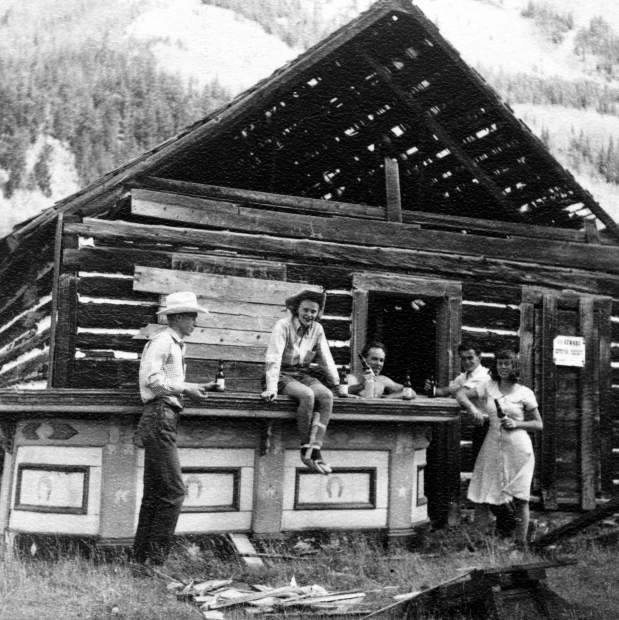 Visit www.aspenhistory.org for information on local ghost towns, Aspen history and more. 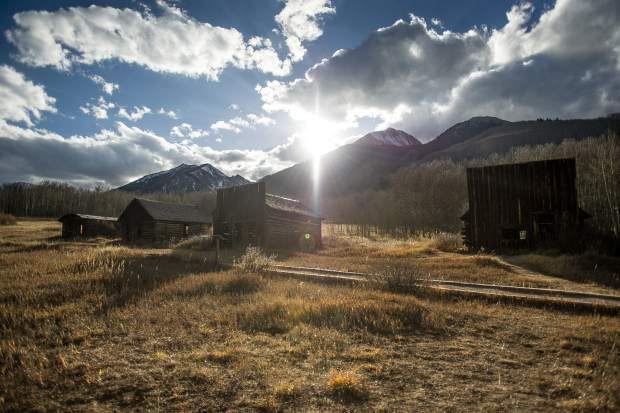 There are stories of Aspen’s past that you can physically feel as you stroll through the ghost towns of Independence and Ashcroft They are stories of hardworking miners, Victorian ladies who set out to be pioneers, children growing up in the wilds of the Rocky Mountains. 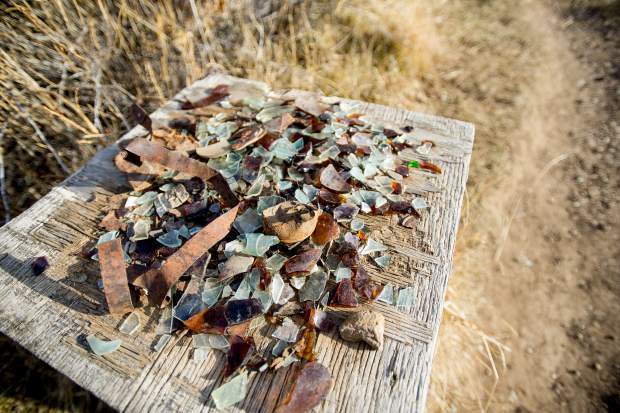 The artifacts of their stories are everywhere here — shards of glass and other shiny objects, stained wallpaper inside dilapidated wood cabins, signs that mark what was once a bustling saloon, hotel, post office and more. 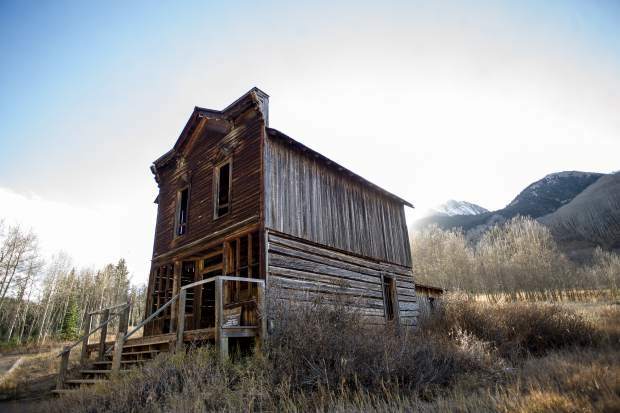 Now those who steward these two towns — Independence, located 16 miles up Independence Pass from Aspen, and Aschroft, situated 11 miles up Castle Creek Road from Aspen — will tell you they are not haunted; rather, they are ghost towns of a different type. 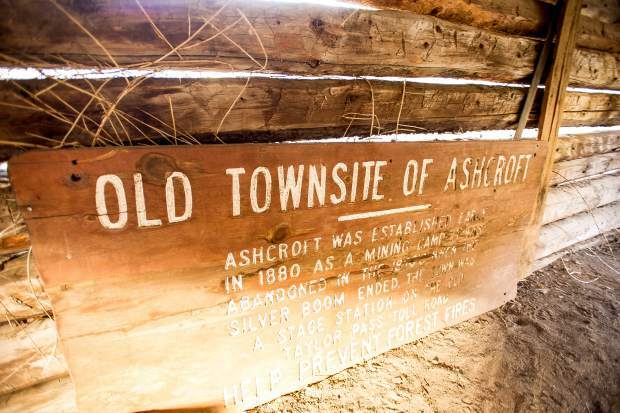 By way of history, Ashcroft once was founded in the spring of 1880 on the prospect of silver mining. 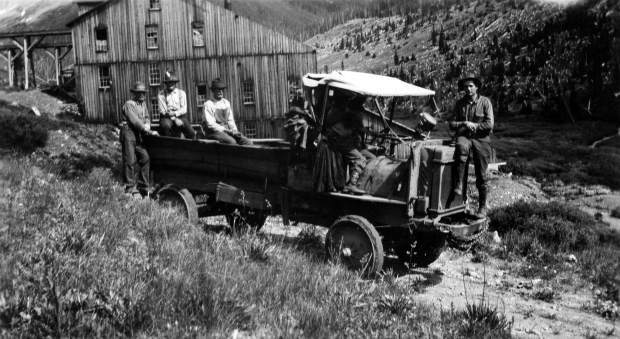 At its height, the town was bigger than Aspen, with a population of 2,000, two newspapers, a school, sawmills, a small smelter and 20 saloons. But as quickly as Ashcroft boomed, it busted. Today, it is home to three restored buildings and six buildings in their original condition. 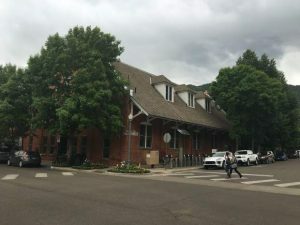 On the other side of Aspen is the town of Independence. 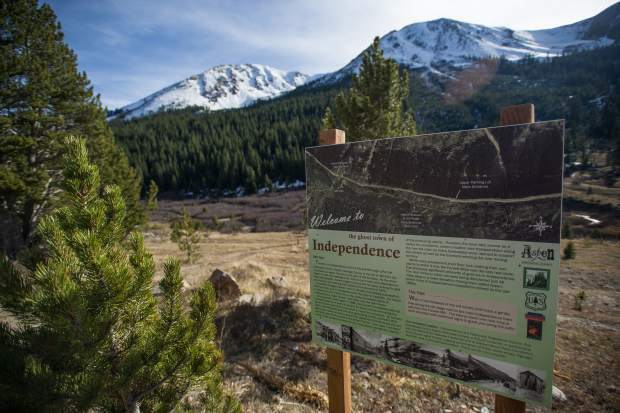 Legend has it that prospectors discovered gold in the area on Independence Day — July 4, 1879. Soon after, a tent city popped up. And, before long, the town had grown to 1,500 residents and boasted nearly 50 businesses. But as luck would have it, gold did not pan out for the miners at Independence. By 1888, only 100 hearty souls remained. 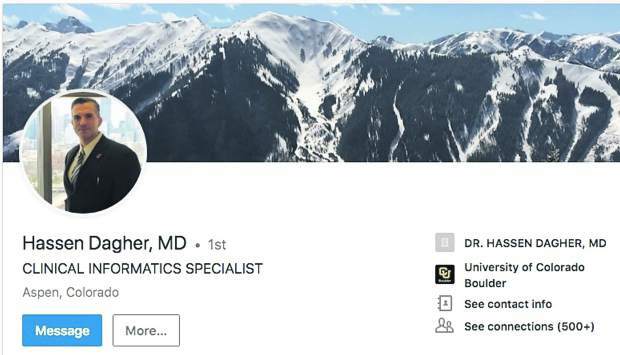 The others decided Aspen — with its abundant work, good pay and milder climate (Independence sits at 10,920 feet) — would be a better place to call home. Then in February 1899, a series of winter storms blocked supply routes to town and those few remaining residents were forced to flee. 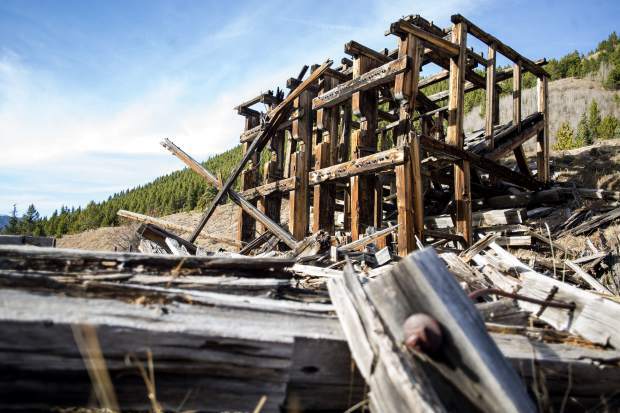 Of course Ashcroft and Independence aren’t the only “ghost towns” around Aspen. 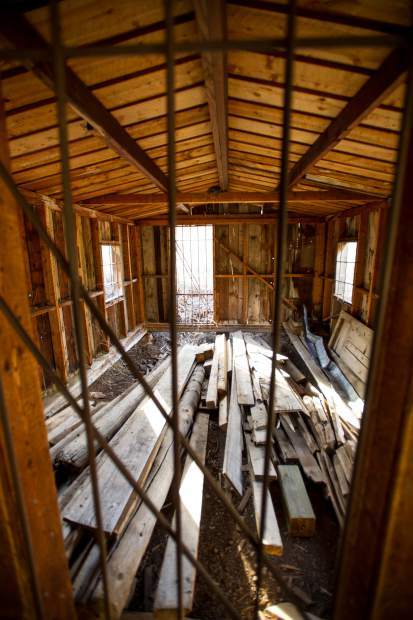 The area was home to many miner’s shacks and small enclaves. 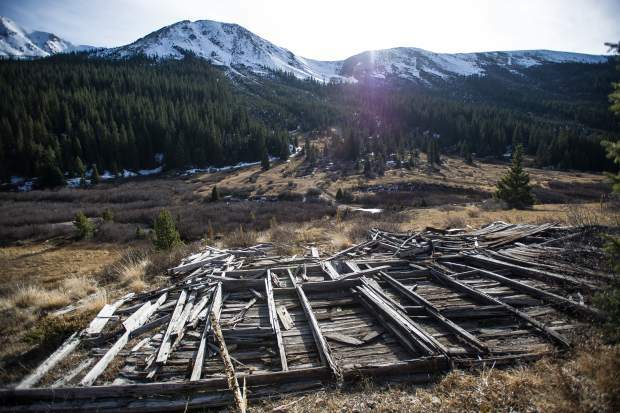 You can still find cabins at Ruby, far up Lincoln Creek Road past the reservoir, and other remnants of the past can be discovered on trails and in the backcountry. 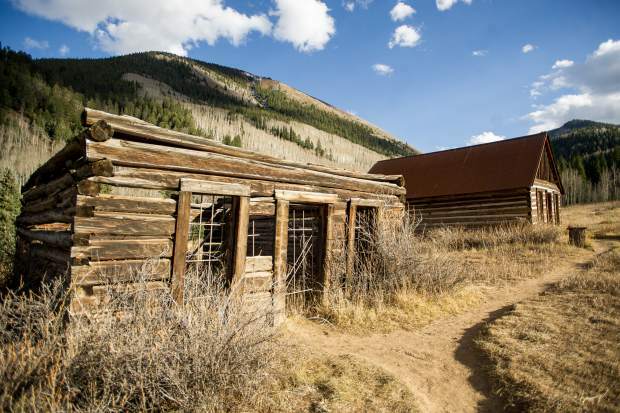 In summer, the Aspen Historical Society offers guided tours of Independence and Ashcroft (both towns are on the National Register of Historic Sites). In winter, Ashcroft can be accessed by foot and the surrounding area can be explored on Nordic skis (it becomes the Ashcroft Touring Center). 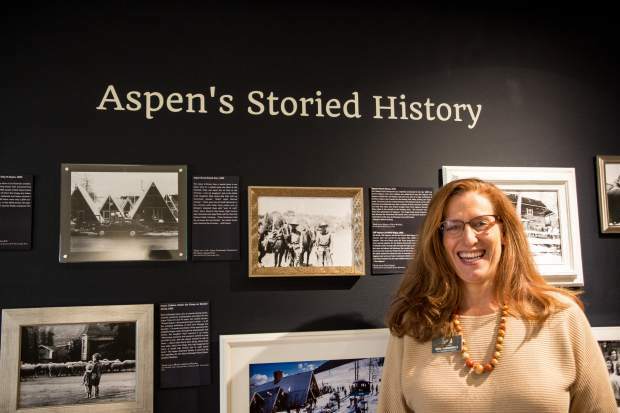 The historical society also offers on-mountain ski tours, where you can learn the history of Aspen Mountain and Aspen Highlands — before they were ski areas and in their infancy as ski mountains. 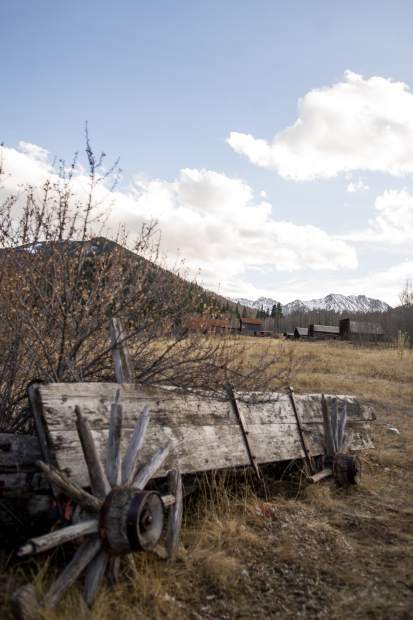 Still other ways to learn about Aspen’s history is by visiting the Aspen Historical Society’s two museums — the Wheeler-Stallard Museum and the Holden-Marolt Mining & Ranching Museum. Walking through Ashcroft on a blustery autumn evening and it’s very easy to do just this. 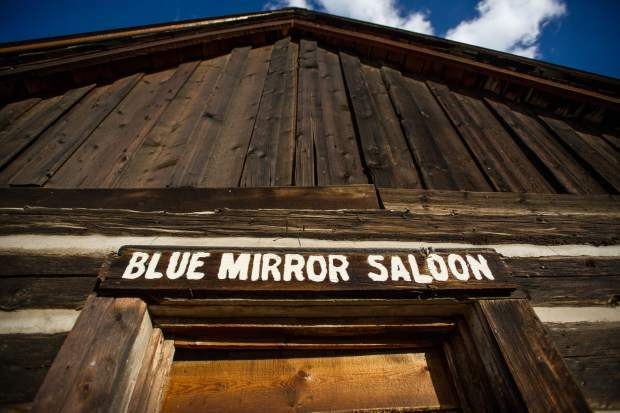 And with a bit of knowledge about Aspen’s “ghost towns,” it’s easy to create a narrative of who the people that lived here were and how they spent their days.